indieWIRE INTERVIEW: Doug Block, director of "51 Birch Street"
The film was met with a host of good reviews but no theatrical distribution deal that quite made sense to the filmmakers, so this week Block will launch the film via the new alternative outlet, Truly Indie, including one-week runs in select U.S. cities. It starts in New York City on October 18 and Los Angeles later this week, followed by debuts in Huntington, NY, Chicago, San Francisco, Minneapolis, Boston and Seattle. Block recently participated in indieWIRE’s email interview series and his answers to our questions are published below. I’ve always loved movies, but it wasn’t until I saw “Citizen Kane” as a high school junior that it dawned on me there was a guiding force behind the camera called the director. From that moment on, I wanted to direct movies, too. Great movies like “Citizen Kane,” that is. It wasn’t until I saw Ross McElwee‘s “Sherman’s March,” I guess it was about 20 years ago, that I realized documentaries could be every bit as witty and entertaining and just plain great as so-called “real” movies. I was already doing documentary camerawork professionally, but that was the film that inspired me to make documentaries myself, and particularly ones that brought a fiction film sensibility to the form. Besides, it seemed more possible to get a doc made than a fiction film. You didn’t need to raise all this money first, or go to the inconvenience of writing a great script. You could just run out and shoot something. industry side etc.) that you would still like to explore? Please talk about how the initial idea for this film came about? I grew up on Long Island and a few years ago, in rapid succession, my mother died unexpectedly, my 83-year old father married his secretary from 40 years ago, and they sold the family house so they could move into her Florida home. If that wasn’t unnerving enough, my father, who was always one of these emotionally distant men who never talked about themselves, was suddenly acting like a love-struck teenager. I went out to the house for one last time about two weeks before the movers were due to come and found, among all the boxes of family history being packed away, 3 large cartons filled with my mother’s diaries going back nearly 40 years. Even then, I wasn’t really thinking about a film. But I had brought my camera along and decided to pop my dad a few questions. And, to my great surprise, he was willing and even eager to talk about his past in a way I’d never heard before. So, I decided to hang around and get to know my father better before he left the area for good. It was only a few days later, when I asked him if he missed Mom and he said “No, it wasn’t a loving association, only a functioning one,” that I knew there was a film here, and that I needed to tell it. 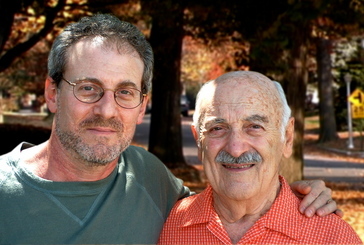 Doug Block and his father, in a recent photo. Image provided by the filmmaker. From the beginning, I felt it was a very powerful story that would resonate universally if I just stayed out of the way and told it as simply and straightforwardly as possible. I wanted the audience to become totally absorbed in the characters and story and not even remember they were watching a documentary. Given that much of the footage was home video shot on mini-dv, a great score was critical in conveying the feeling that you’re watching a real movie. We ended up using over 45-minutes of original music, very restrained but extremely evocative, created by a brilliant young composer named H. Scott Salinas. And because I was so close to the material, I leaned a great deal on my main collaborators: editor Amy Seplin and producing partner, Lori Cheatle. developing the project or making and securing distribution? The decision to reveal what was in my mother’s diaries was the most difficult challenge, especially the parts dealing with her sexual frustration. I mean, what son wants to go there? She was very committed to exploring who she was as a person and I wanted to honor her by being as truthful as possible, yet not cross the line of propriety, as odd as that probably sounds. To sort through all that material and pick just the right words and phrases to paint a portrait of a complicated woman that I loved dearly was a huge responsibility and burden. I had many sleepless nights, especially during the period of editing when the diary sequences just weren’t working well. I’d lie there obsessing over them, and whether a Jew could actually burn in hell for doing this to his mother. In terms of distribution, to somehow find a way to get your film out theatrically without losing your shirt or giving away all your ancillary rights is always the big challenge for indie filmmakers. It wasn’t fun to have so many distributors pass on the film despite all the success it’s had at festivals, but Lori and I are really happy we wound up with Truly Indie. We think it’s a really smart distribution model, and we’re happy to be working with a pioneer like Mark Cuban and a company that’s trying to do something different. I made a 9-minute fundaising sample which focused mainly on the relationship between father and adult son. Among others, I took it to to Lisa Heller at HBO, and she and especially Sheila Nevins responded even more strongly to my mother’s story – and how it was emblematic of a generation of bright, college-educated women who migrated to the suburbs during the 50’s and 60’s and had a tough time with it. I give Sheila a lot of credit for gently challenging me to tell that story through my mother’s diaries. Originally, I had no intention of going there. But it’s really the heart of the film, and Sheila knew that instinctively. I’ve found HBO is great to work with, and once they were on board, the European broadcaster ZDF-Arte was soon willing to join forces. I have another personal doc about my family in the works that Lori is producing with me, and we’re also developing other projects with the Priddy Brothers, our “51 Birch” executive producers. More immediately, I’m helping out as producer on two extraordinary documentaries. The first is Esther Robinson‘s personal doc, “The Danny Williams Story,” which was just selected for the Forum section at next year’s Berlin Film Festival. It’s about her uncle Danny, who was Warhol’s lover when he disappeared in 1966, never to be found. While making the film, Esther discovered 20 rolls of film he shot during his time at the Factory and it’s some of the most jaw-dropping, eye-popping footage I’ve ever seen, period. And holds real clues to both his disappearance and his disappearance from the history books. The other project is called “American Harmony,” directed by Aengus James, which follows a half dozen barbershop quartets over the course of the past year as they make their way towards the international competition, which one of the groups wins by the slimmest margin ever. The music is great, very different from your parents’ barbershop music, and, like other successful competition docs, it builds up a lot of suspense. We’re aiming to be ready by the end of the year, but there’s this festival in Park City that might have something to say about that. My all-time favorites all go back a ways. As I’ve mentioned, “Citizen Kane” inspired me to be a filmmaker and “Sherman’s March” inspired me to be a documentary filmmaker. Others that come immediately to mind are “Wild Strawberries,” “The Battle of Algiers,” “Shoot The Piano Player,” “The Lady Eve,” “Children of Paradise,” and “The Last Picture Show.” As well as just about every film of Buster Keaton. Stop worrying so much about getting your film into Sundance and being discovered. The best way to get discovered is to make a great film. Period. that you are most proud of? Founding and sustaining The D-Word Community, an online discussion forum for documentary professionals from around the world. It started out in 1999 as an offshoot of the blog I kept during the making of my last film, “Home Page.” Seven years later, it’s a thriving virtual community for almost 2,000 members from 77 countries. When I see how much discussion goes on there every day, all the generous sharing of knowledge and experience, and experience the genuine camaraderie among documentary filmmakers everywhere, and then realize I made this happen, well, there’s nothing more rewarding. [For more information about “51 Birch Street,” please visit the film’s website.